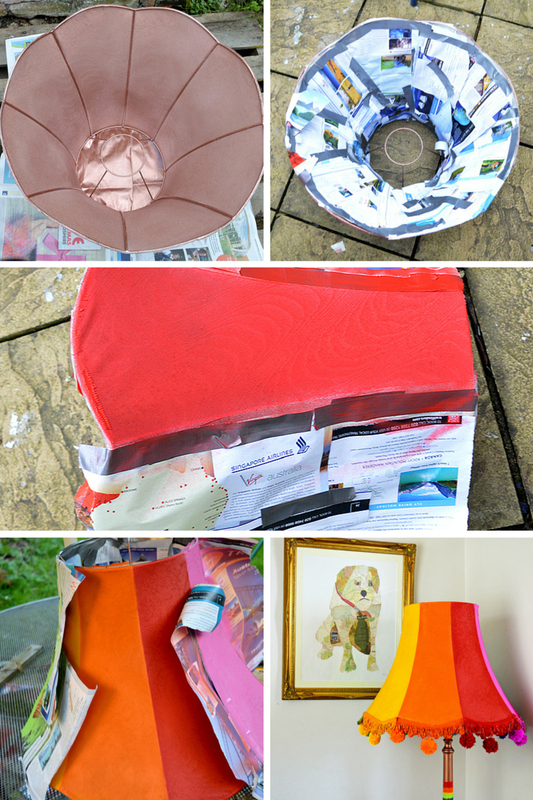 Last week I transformed a dreary old floor lamp with spray paints into a colourful statement piece. This project was so easy and didn’t require any specialist skills; as long as you can shake a can of spray paint you can revamp a lamp. I picked up this floor lamp really cheaply from my local auction house. I wasn’t sure if it worked, that didn’t matter as this was a rather old lamp I changed the electrics anyway, just to be on the safe side. All the stuff you need to do this electrical update with can be bought from your local diy store and is as easy as changing a plug. 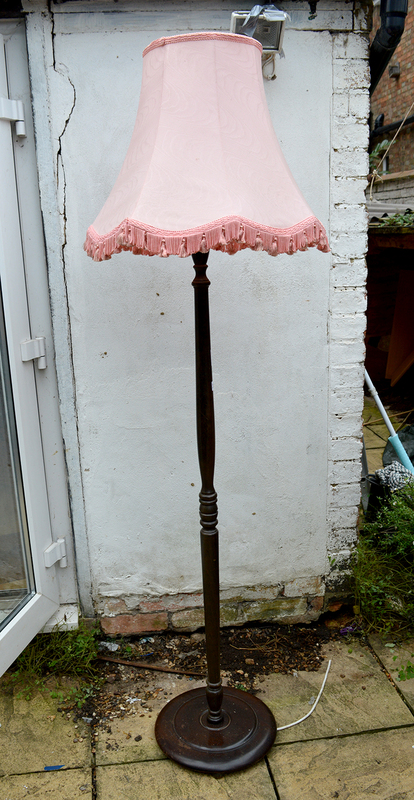 You maybe lucky and pick up a floor lamp that has had its electrics updated recently. 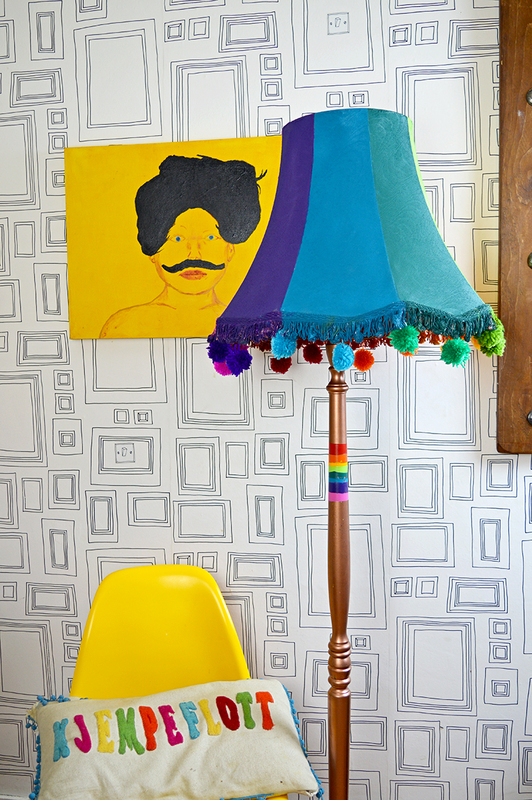 Upcycle a floor lamp with spray paints to create some rainbow decor and decorate with a colourful pompom trim. Selection of colourful spray paints. I used a copper spray paint for the base of my lamp and the inside of the shade. The lamp shade was in 8 sections so I decided to paint each section a different colour to obtain a rainbow effect. Yarn in rainbow colours for making a pompom trim. I took the lampshade off the stand and then spray painted the stand copper. I gave the whole thing 2 coats in total. I sprayed the inside of the lampshade with 2 coats of copper paint. 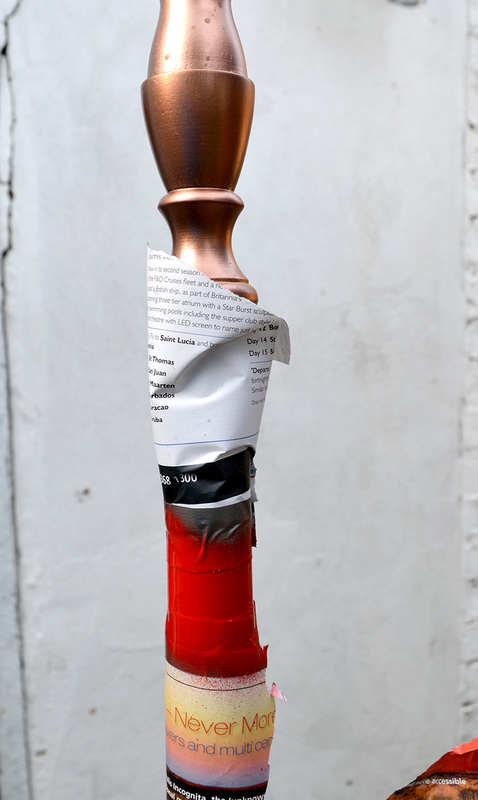 When dried, using newspaper and masking tape I covered the inside of the lamp to protect it. I spray painted the outside of the lampshade one section at a time. Using a different colour for each section in the order of a rainbow. I made sure that the bits not being sprayed with a particular colour were well covered up with newspaper and masking tape. To add interest to the lamp stand I spray painted a rainbow stripe on it. Using the same newspaper/tape cover up method with each colour spray. 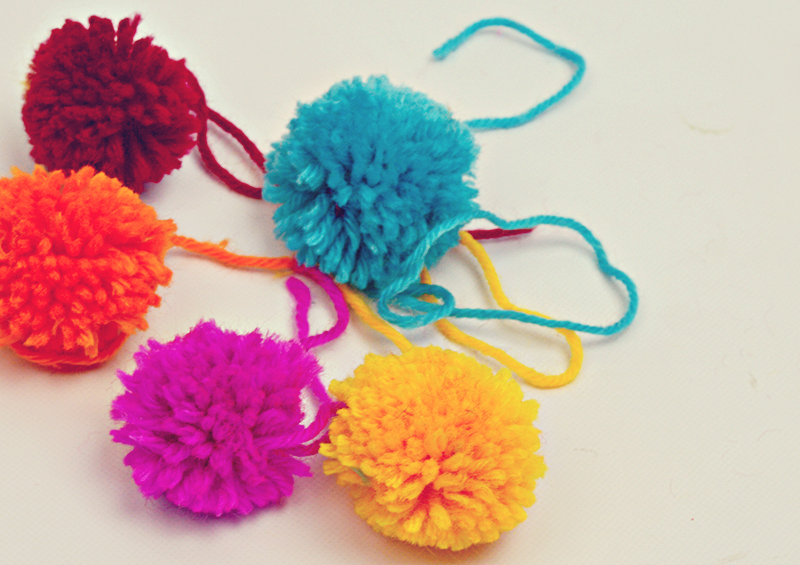 Finally I spray painted the existing trim in the rainbow colours and made 16 pompoms 2 in each of the eight colours. This I attached to the lampshade with a hot glue gun. Before I started this project I had no idea how my upcycled floor lamp would turn out. I had never spray painted fabric like this before, but felt I had to try it as it was the only way I was going to achieve the bright rainbow effect I was after. As you can see it worked out really well, I love my new floor lamp and the pop of colour it now brings to the room. 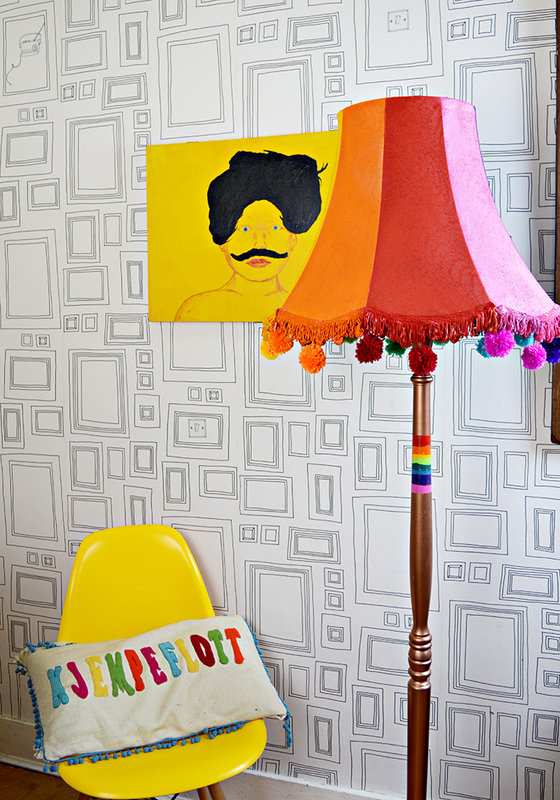 You might want to check out my other ideas for rainbow home decor or how to wallpaper lampshades to match your decor.. Your revamped lampshades (both spray painted and wallpapered) look amazing. My question – does this not make the light too dim? Thank you. I still have a ceiling light the lamps provide ambient lighting. Claire, your beautiful lamp revamp came at the right time for me! I have a lamp shade that is a very odd shape and isn’t in very good condition. I’ll have to glue the fabric to the frame at the top and bottom before I can do anything else to it. I don’t want to go with a different shade as this one “makes” the lamp. I too have wanted to paint the shade but my concern has been about the heat from the bulb being too intense for the paint on the shade. Have you experienced any problems with that? I’m not even sure yet what color the lamp itself will be! Thank You ! I haven’t had a problem with heat from the bulb. The heat doesn’t radiate very far so the bulb is only hot if you touch it and the lampshade is a good few inches from the bulb so doesn’t get hot. 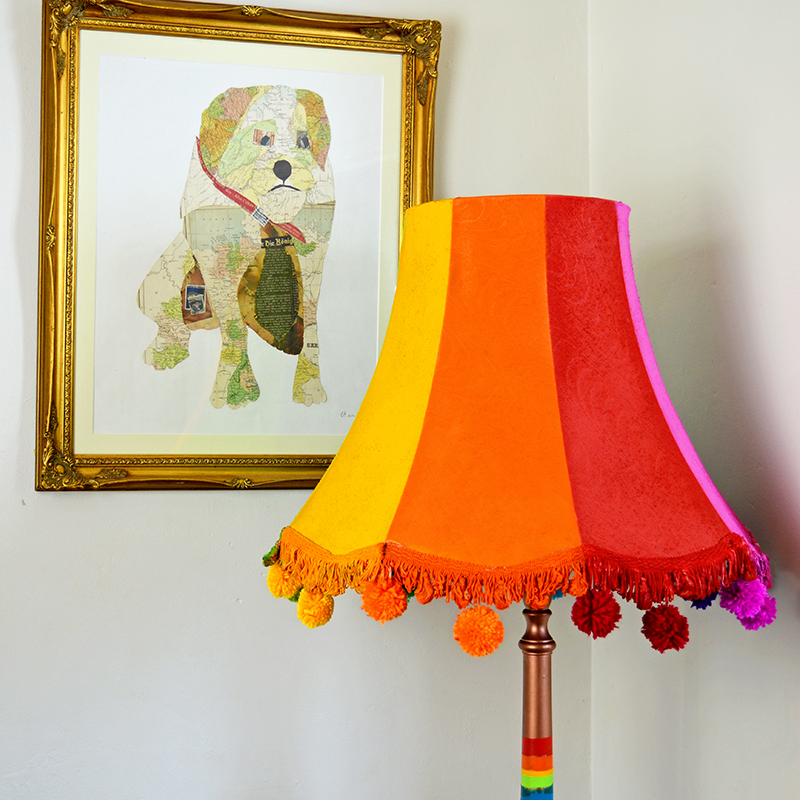 Your lamp upcycle is undeniably awesome! It looks so effective! Was it difficult to get an even coverage on the trim? Thanks to your post, I feel inspired to track down and old lamp and get upcycling, haha. Great project! Thank you ! No it only took a couple of coats to get it even. Claire, that is one of the funkiest lamps I’ve ever seen. I’m loving it! Thanks so much for sharing it at Vintage Charm. 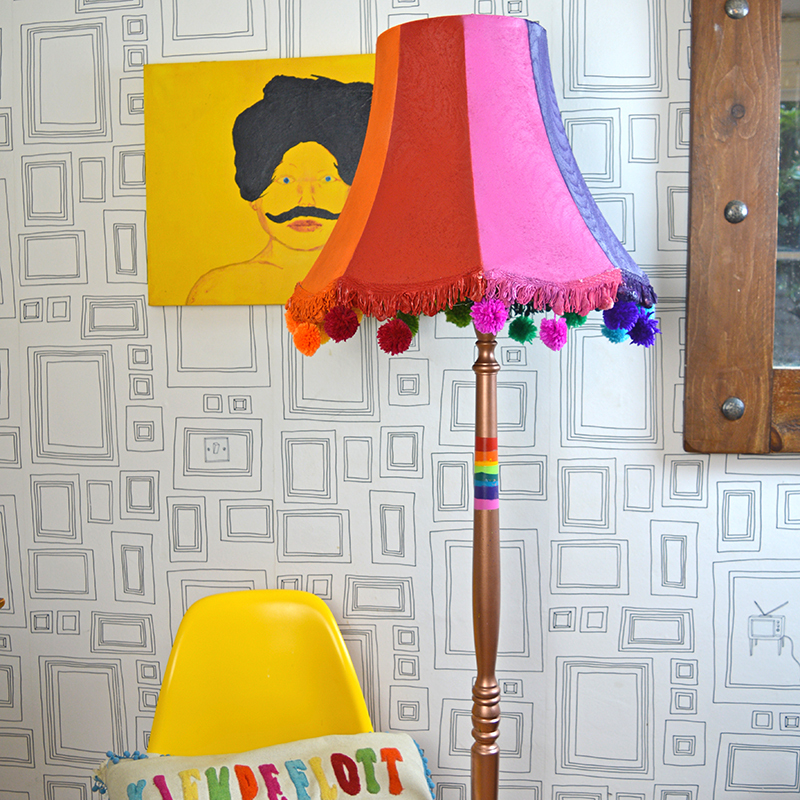 Such a cute lamp makeover! I love that it’s now so colorful, and the pom poms add so much fun! Thanks for sharing at the Submarine Sunday Link Party! I love how bright and cheery this lamp is! Pom poms, fringe, and rainbow colors= perfection. Thanks for sharing! Thank you very much ! I do like a rainbow. Thank you very much ! Thanks for the invite I have joined your link party. What a fun update for a lamp. Thanks for linking up to the Talk of the Town party! Absolutely adorable!!! totally Pinning this! What fun! You did a great job! Thanks ! I know what you mean, I love also to look at everyone else’s upcycling ideas. I do get a buzz from revamping the unloved, and making it loved again. What a fun upcycle project! Thanks for sharing at My Flagstaff Home! Really fabulous! Thanks so much for sharing on Craft Schooling Sunday! 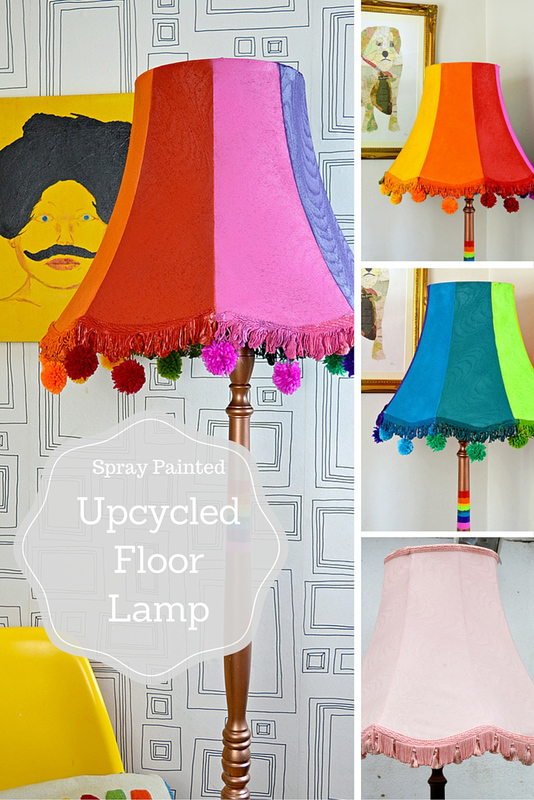 I wouldn’t have thought of using spray paint for this, meaning the lamp shade part! Thanks ! I thought I’d give spray paints a go, and it turned out really well. I love this, can’t have to many splashes of colour for my taste. Great idea to spray paint the fabric too, I was imagining lots of difficult fabric piecing, this looks much more doable! Thank you ! Its soo easy and doable ! Thanks I don’t see why it wouldn’t work on metal I’d give it a go anyway. Oh My Garden this is a seriously fun and cheerful lamp!! I love it! It’s like you dipped it in the fountain of youth 🙂 What a great makeover! Thank you so much for sharing this inspiration at Making Broken Beautiful! I hope you will join in again … you are always welcome! Thank you so much for your poetic kind words ! So great! Looks awesome against the black-n-white background. How original!! Thanks I love to add colour to my home with pictures and furniture.